Great for exploring London. 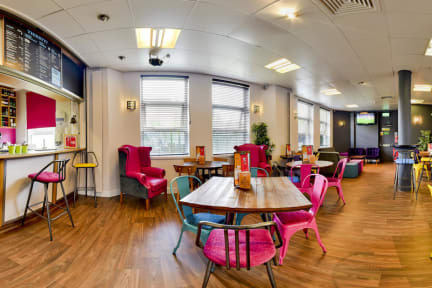 YHA London Thameside is a busy 24-hour hostel with easy access to Heathrow and Gatwick. It has convenient underground links to the Excel Centre, Canary Wharf and Greenwich as well as Central London with Westminster only 20 minutes away. If the Tower of London, Tower Bridge and the London Dungeon are on your list of must-see attractions, this is a perfect location. 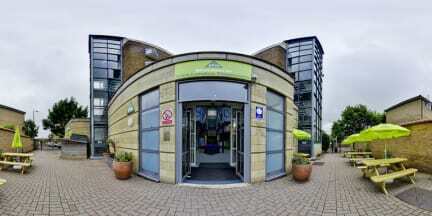 Situated over the Thames from the Docklands, this modern YHA offers en-suite rooms and excellent bus and tube links. Quays caf/bar and the Traders Gallery restaurant cater for your needs. London Attractions: We sell discounted and fast track entrance tickets to some of London’s most famous sights and best kept secrets. Including the London Eye, Madame Tussauds, The Tower of London, Walking tours, Bike tours, boat trips and many, many more. Plus, every penny we make at YHA goes directly back in to our charity ‘Breaks for Kids’ which makes it possible for children from financially disadvantaged backgrounds to take part in school or community group breaks away! Ask us for a full activity list on check in. A good place to see something of London for a reasonable price. The distance to the city centre is goid for bikers. Lee's goid for pedestrians. It is a bit complex to find the entry to the building. Dinner is ok. Breakfast is very good. Someone took my bed when I left my ride in the middle of the night, the staff moved me to another room, very annoying, I missed a USB cable because of that. Away from the city center. Sometimes cheap can be expensive. It was not the best experience. Pros: It is very close to a cheap mall where I was able to buy good quality socks and pharmacy stuff, also close to London Eye.